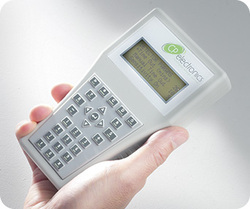 The UNLCDHS is a compact infrared handset used for the operation, configuration and programming of CP products that have the ability to be programmed via IR and/or RF. These include the PRM, DD, AD, Vitesse Plus, Rapid, D-Mate and An-10 ranges. USB port: USB connection can be used for saving device settings, updating the handset’s software and as a programming connection for D-Mate programmable addressers. An-10 wireless connection: two way communication with An-10 products. 1. Download the latest software from the link below. The software is in the form of a Zip file. Ensure that you computer can Unzip this type of file. 2. Unzip the file and copy the contents (HS_Data.cfg and HS_Fw.hex files) to the root of a USB flash drive. 3. Insert the USB flash drive into the USB port on the Handset. 4. Use Handset Config menu and scroll down to ’To Bootloader'. Press Enter (or Right) to select. 5. Hold down ‘Delete’ while pressing ‘On/Off’. The handset will then reboot, read the USB flash drive and update itself. 6. Progress is shown. Do not remove USB drive while in progress. 7. At the end, the handset restarts the menu system. 8. Remove the USB flash drive.